H.264/AVC or MPEG-2 encoder, decoder and media edge adapter with up to 4 codec modules per unit. Configured via an easyto-use web interface, the NX4600 Media Gateway is an encoder, decoder and media edge adapter that can be deployed with up to 4 codec modules per unit. Each codec module offers Baseband SDI video signals to IP and vice versa, compress or decode using H.264/AVC or MPEG-2, and transmits or receive the streams over IP/Ethernet. A codec module can be software licensed for both feature sets, so that it can adapt to changing requirements in different broadcast productions. The NX4600 supports transmission of up to 16 channels of embedded audio for SD/HD-SDI (32 for 3G-SDI). Handling of embedded audio, whether it’s linear PCM or pre-compressed audio, and fully transparent when using SMPTE 302 audio pass-through. For applications where bandwidth is limited, options for audio compression are available, either using MPEG-1 Layer 2 (MPEG audio) or MPEG-4 AAC-LC. Equipped with dual GigE electrical and optical interfaces for IP connectivity. All codec modules of the NX4600 can use the same GigE ports for TS over IP input and output, thereby reducing the number of ports needed on the network access switches. 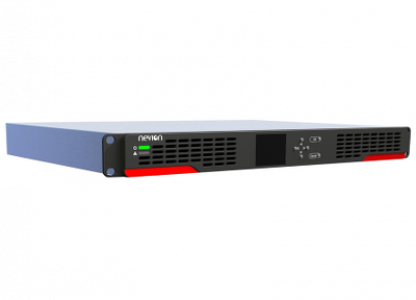 The NX4600 offers advanced protection mechanisms that enable real-time transport of professional media over IP networks, as well as built-in monitoring that helps anticipate and correct any issues with the network or transport should they arise. The supervision and connection management of the NX4600 can also be performed via Nevion’s VideoIPath or any 3rd party Network Management System.